Need extra storage? Convert the overhang space at the front of your 5th wheel into a useful storage area. 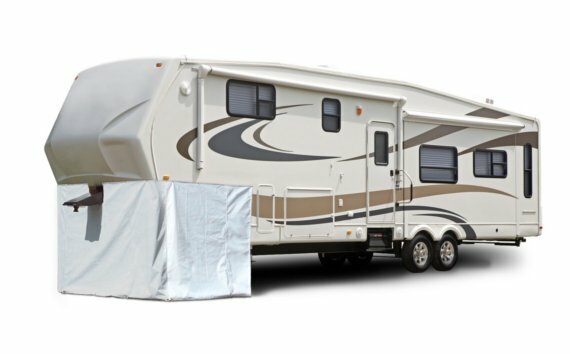 Our Fifth Wheel Storage Skirt features zipper doors for easy access on all three sides and a removable Velcro cutout for the tongue. Each skirt is made of heavy-duty, three layer white-laminated vinyl and extends from the bottom front of the unit to the ground. Screw-in snap fasteners and tent spikes are included for your convenience and ease of installation. 5th Wheel Storage Skirts are warrantied for 3 years.